We thought it would be great to learn a bit more about who is using the 4PocketsAudio range and what they are using it for so it give me great pleasure to welcome you to our very first 4PocketAudio.com Monthly Interview. I am a big fan of MashUps, as well as enjoying the tracks I am fascinated by the process that artists go through to create them. So I am really pleased that the award winning DJ Flashard has agreed to be the first of monthly interviewee and tell us a bit more about Mash Ups. Q. Tell us a bit about yourself and what got you interested in MashUps. A. “I’ve always been interested in music – certainly from a very early age. I was always going out spending my pocket money on the latest chart music – 7” vinyl singles and, if I could afford, LPs. One of my earliest memories is buying the original Village People – YMCA records and playing on loop on my Dads record player (until he asked me to stop – presumably because he’d heard it too many times!). So I kind of grew up listening to music, from the sounds of the late 70’s, through the 80’s and the New Wave of British Heavy Metal (I’m a bit of a rocker at heart! ), and up to today’s tracks. Having done a bit of DJ’ng work in my late teens, I was always interested in different remixes and the idea of creating a continuous mix by blending records in to one to create sometime new. Then, one day in early 2009, some years after my DJing days were over, I stumbled across a website where you could download separate instrumental and acapella tracks from various artists, which set me on the road to finding and falling in love with mashups. Around the same time, I also discovered a website call MashStix who let you post your own creations and people gave feedback / their opinion on what you’d done. This was (and very much still is) a very friendly place and where I am now a moderator for the site. Kind of feels like a home, having grown up through the ranks”. Q. What gives you the inspiration for a Mash Up, do you just hear a track and think yes I want to work with that? A. “Sometimes, yes, I’ll hear a track and think ‘that will work nicely with such and such’, but it really depends if you can find and download the parts (acapella, instrumental or stems) freely on-line. Normally, when I’m looking for material, it will be a track I know and like – I do this as a hobby, not as an income, so I like to work with music I enjoy myself. Otherwise, it’s trying to find tracks that key match, have a similar tempo and you’re able to work with the structure of the tracks to ensure the verse and choruses can be made to match”. Q. When I look at your Mash Ups you don’t seem to go for either easy or obvious matches, I am thinking of your Beyonce vs Greenday, and Edwin Star vs Genesis vs Public Enemy vs Beyonce (War and Confusion) so How do you decide which tracks will work together? A. “Key matching is the key, excuse the pun! The keys have got to match, otherwise it will sound awful. I use a programme called Mixed In Key to help. Most Mashup producers will aim to bring artists from different genres together in their work – certainly there is more kudos in the scene for mashing different styles and genres together and making something new. For my War and Confusion mash, it was for the final of the MashStix Mash Challenge from 2011 – they had very clear rules on what was required for the final of the competition, but I also wanted to run with a theme on that one, and doing a multi-source mash was certainly outside of my comfort zone (although I did okay as I won the comp!)”. Q. I know this is going to sound a really simplistic question but once you have got your tracks how do you go about mashing them? A. “On my PC, I use a programme called Sony Acid Pro to mix the different sources together (although they are others available). I start by laying down the instrumental and setting the tempo right. I then add the vocals / acapella on the top and set the tempo of that to match the instrumental. It’s then a case of matching up the verses and choruses, trying to match the chord progression, adding some effects to the vocals, volume balancing the sources and generally trying to make the various parts blend together to sound like an original track”. Q. I know you have used your iPad for some of your Mash Ups, how do you find working on it compared to your desktop. Q. There are a great range of quality music apps available for the iPad, do you think this is leading to it being considered as a mainstay of the recording studio rather that something they can use when they are on the move? A. “I only really use Meteor on my iPad. I have other music apps like keyboards and drum machines, but I’ve yet to use them in producing a mashup (although I love the idea of programming my own drum loops and use stems to replace the original drums with my own). I guess with apps like Garage Band and Meteor MultiTrack Recorder being more and more popular, there shouldn’t be any reason why producers and remix / mashup artists won’t start using iPads and tablets in more scenarios”. Q. What advice would you give to someone who wants to make their first Mash Up? A. “I don’t really know. Probably more of the same. As I said, this is a hobby for me, so it’s finding the time away from my work, family and social life to make more mashups, although I find it an absolute honour and privilege to be asked to contribute to a number of mashup albums that are put together and freely available online (Envision’s Smash the Genre and SoundUnsound’s Summer Booty 2012 albums, to name just two – check them out!). I also enjoy entering competitions, so, time permitting, I should look out for a few more of those. Otherwise, watch this space and check out my blog”. Also check out MastStix.com its a great place to head for if you want to know more about Mash Ups. Look out for next months interview is with Milos Twilight, Producer of the Gothic Assassins Movie. Jazz icon and head judge of Indonesia Idol Indra Lesmana has released an iPad only track, “Two Steps at a time” was created on his iPad using Meteor Multitrack Recorder. Everything you hear in this song is recorded and mixed with the new iPad using meteor DAW and virtual instruments, Tascam IU2 audio interface, Electro Harmonix vocoder, Moog Littlephatty and Hammond melodica 44 with pitch to midi converter controlling various soft synths from Logic Pro. Auroraallows a mixture of pattern based recording and live performance. You can piece together complete compositions or simply improvise a performance. All of which can be captured to a file, for use as a ringtones, or to share with others. PasteBoard support means you copying of all or part of a songs audio to other applications.Aurora also allows you to copy multi-track audio directly into our multi-track recorder Meteor. 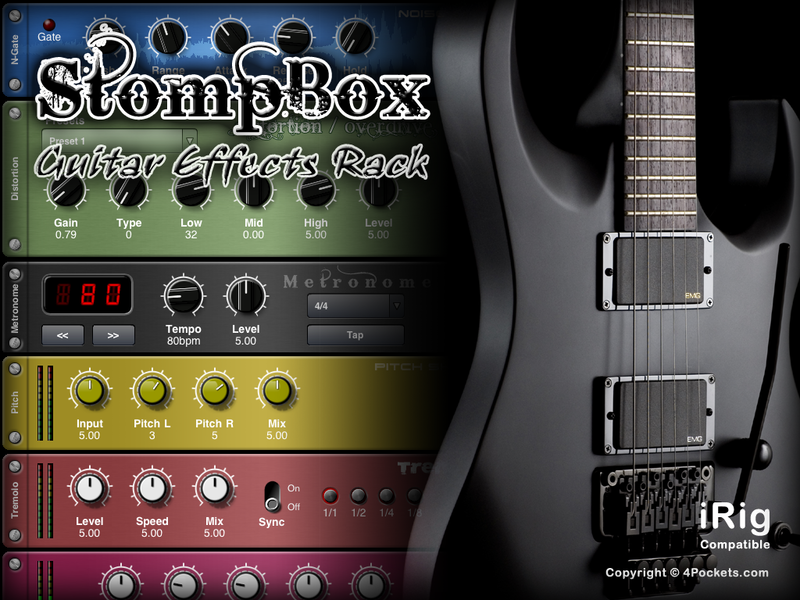 An addictive track from Snare Complex written on 4Pocket’s Aurora Sound Studio HD. Guitar recorded and processed in Ablton Live Lite 8.